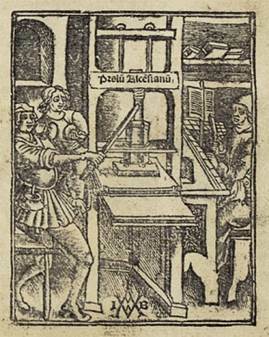 Title page detail from: Paolo Emili. De Rebvs Gestis Francorvm. Paris: Jodocus Badius Ascensius, 1520.
ocated in the Southwest Collection/Special Collections Library, Rare Books is a rich resource for research and creative activities. Within its 38,000 volume holdings are rare and early printed books, many of which are limited edition, illustrated or finely-bound. These are complemented by collections of artists' books, manuscripts and maps. Areas of strength include the history of science and medicine, American and European literature, book history and book arts, Russian and European history and culture, Mesoamerican and medieval European manuscript facsimiles, Greek and Roman classical authors and	dowsing.